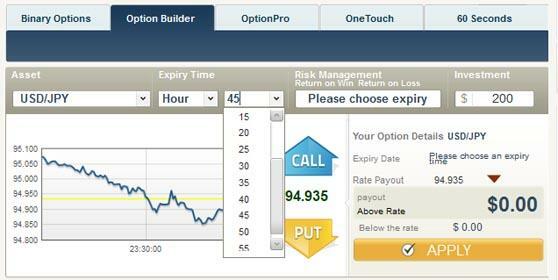 Established recently in 2011, TradeRush is a late entrant to the binary options brokerage industry. Based in Cyprus, TradeRush is regulated by the Cyprus Securities Commission (CySEC). Even though this binary options broker has only been operating for around two years, it is well regarded by many traders for the high quality of their services. They are credited as being the creator of the 60 second options trade. With high returns of up to 81% from a single trade and a diverse range of assets to trade in, it is not surprising to find TradeRush is expanding its market share at a phenomenal rate. Powered by SpotOption trading engine, TradeRush’s trading platform work pretty smoothly. The interface is designed in such a way so traders will have no problem navigating their way around. Simple to use, trading transactions can be completed with as little as 4 clicks of the mouse. Being a web based trading platform, there is no need to download any software in order to make the trading platform functional. Once a client has opened and deposited his funds, he can start trading straight away. The TradeRush’s trading platform has two notable features which makes it stand out from the rest of the crowd. 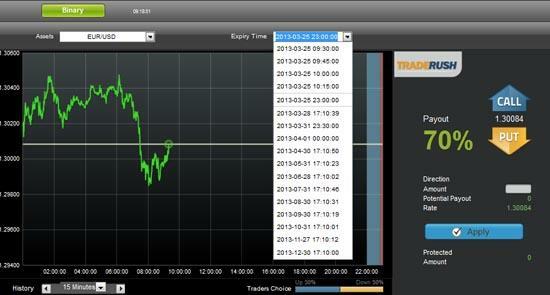 This feature can be used as a stop loss tool by letting traders extend the expiry period of their options. Hence, traders can essentially “buy” more time with just a click of the mouse when the market is not performing according to expectations. Developed by third party developers, traders also have the option to download applications for their android or iPhones to enable them to trade with their mobile devices. The most popular and simplest type of binary options to trade with. Returns can be as high as 81%. With an expiry period of up to a week, traders can reap a return of up to 500% if their trade is in the money. Let traders decide their expiry times hence letting traders have an element of risk management. Also with variable expiry settings, this type of trade also allows traders to have a better view of the trading charts while they are trading. The payout ratios at TradeRush depend on the type of trades made. The average return ranges from 71% to 81%. For One Touch trades, the ratio is as high as 500%. Out of the money trades still entitle traders to a refund of 15%. At TradeRush, there are around 90 underlying assets in four different classes to deal in. Below is a list of underlying assets that are available for trading. Traders at TradeRush have the convenience of several methods of fund transfer. Major credit cards like Amex, Diner’s Club, MasterCard and Visa are supported. Credit cards transfer is the most expedient method of transfer with a processing time of 24 hours at the most. Apart from credit cards, traders also have the choice of other payment processors like Moneybookers, Liberty Reserve and wire transfer. All these methods are reliable, secured and efficient with very little chance of their integrity being compromised. When you go over what TradeRush is offering their clients, there really isn’t anything to complain about. Despite being established only in 2011, they seem to be a pretty mature business operation. TradeRush had made it very easy for anyone to access the financial markets with their low minimum deposit requirement of $200. But what I like about them most is the fact you could trade with an amount as low as $5! Very few brokers had made it that affordable. 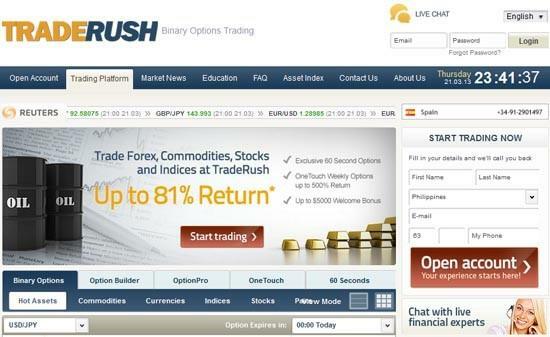 If you are looking for a binary options broker to deal with, I seriously urge you to consider TradeRush as one good possibility.